Creativity isn't born, it's cultivated—this innovative guide distills the work of extraordinary artists and thinkers to show you how. All the imagination needs to be fruitful is exercise. 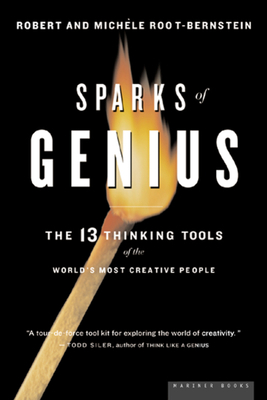 Robert and Michele Root-Bernstein identify the thinking tools employed by history's greatest creative minds—from Albert Einstein and Jane Goodall to Amadeus Mozart and Virginia Woolf—so that anyone with the right mix of inspiration and drive can set their own genius in motion. With engaging narratives and ample illustrations, Robert and Michele Root-Bernstein investigate cognitive tools as diverse as observing, imaging, recognizing patterns, modeling, playing, and more to provide "a clever, detailed and demanding fitness program for the creative mind" (Kirkus Reviews). ROBERT and MICHÈLE ROOT-BERNSTEIN have been studying and consulting on creativity for more than a decade. Robert, a professor of physiology at Michigan State University and the winner of a MacArthur Fellowship, has also written Discovering: Inventing and Solving Problems at the Frontiers of Scientific Knowledge. Michèle, an award-winning historian, has written about and taught history and creative writing. Together the Root-Bernsteins are the authors of Honey, Mud, Maggots, and Other Medical Marvels.